Getting proper sleep at night is often one of the primary challenges during the camping trips. We are not accustomed to the cold and hard ground and that interferes with our sleep. Moreover, you are perpetually scared of potential creepy crawlies that may find a way to your ears. Add to that, the body pain that most of us suffer as we are not accustomed to sleeping on the hard ground. In fact, do not underestimate the impact of this. It can be rather painful for many and ruin the complete purpose of the trip. But not anymore! Today you have a variety of air mattress that seeks to provide the home-like comfort to you in a camping tent. Now you don’t only have a great night’s sleep but also wake up refreshed. 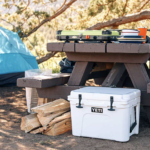 Most importantly, you don’t have to carry too much weight on your camping trip to make sure that happens. With the air mattresses gaining popularity, campsite sleeping is becoming increasingly less painful and a matter of comfort actually. These are lightweight, and you can simply carry an electric or a hand pump to fill these. So in very simple terms, this is an easy solution to a rather serious problem. 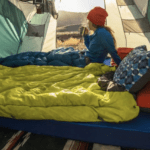 But how will you choose the best air mattress for camping? 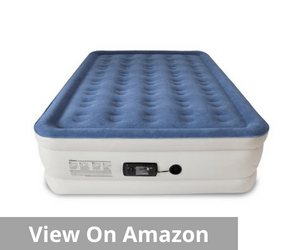 There are many aspects of an air mattress that you may have to consider. They range from offering the most comfortable sleep to the lightweight versions. It can be choosing between an easy to pump option or a more ergonomic one. Of course, you also need one that easily fits into your budget. Well, you can chuck all the hassle and simply refer to this list that we have put together. We have ensured to include some of the best air mattresses for camping that is available globally. 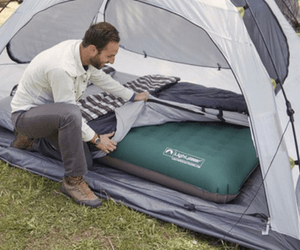 When you are shortlisting the best air mattress for camping, it is impossible to create the list without including the SoundAsleep Dream series. Whether you consider convenience, comfort or design, this is a definitive winner from all angles. It is one of the most innovative offerings that can guarantee a definite degree of comfort for all. The SoundAsleep Dream Series air mattress comes equipped with ComfortCoil Technology. This is not just the most advanced air mattress technology but also amongst the few that can guarantee maximum comfort. 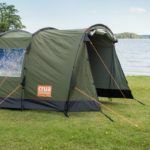 Whether you are making arrangement for sudden overnight guests or just being comfortable at a campsite, this one guarantees maximum support. The mattress is made from 15 gauge material and has a multi-layered flocked top. This creates a comfortable sleeping surface and ergonomically suitable sleeping conditions. The built-in pump that comes with this mattress also adds to the convenience factor. Just a single click toggle enables inflation and deflation of the mattresses. The design of this pump also deserves a special mention. It is made in a way that it is at least 20% quieter than most other pumps available for inflating these mattresses. It can inflate or deflate a mattress in 4 minutes flat. 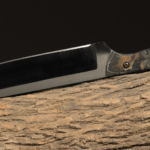 The patented SureGrip Bottom is another big advantage. It ensures that the bed does not move or slide unnecessarily and provides the best possible grip. The puncture resistant material that is used for this mattresses too adds to its charm. This makes the mattress durable, long-lasting and ensures that it is not subject to wear and tear that often. This mattress can withstand a combined weight of 500lbs. So that makes it suitable for more than one people to sleep on a single mattress any time. However, there seem to be some inconsistencies in the quality of the pump. So it makes sense for buyers to carefully analyze the quality of both the mattress and pump before going for it. Of course, the proactive customer service ensures that those who have a problem can seek redress rather quickly. The company has also been known to take corrective steps in case of complaints. 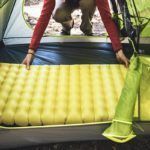 When you are deciding on the best air mattress for camping, the Lightspeed Outdoors undeniably deserves a mention. This PVC-Free Air Bed with a patented stabilizing system can guarantee a comfortable sleep as you can imagine, outside the comfort of your bedroom. The top and bottom layers of this mattress have connectors attached to it. This helps in distributing the weight evenly to minimize the overall disturbance. You also have the option to adjust the firmness of the bed as per your convenience. The battery-operated pump and the built-in Boston valve make a significant difference to the overall user experience. 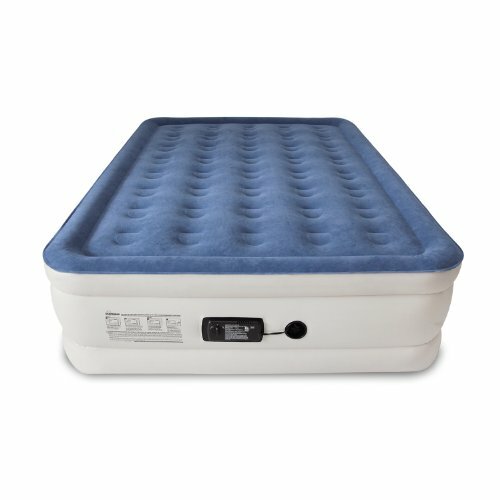 In fact, given the unique Boston double-valve design, inflation/deflation of the mattress becomes rather simple. It is easy to operate and rather simple to adjust. The material of the mattress deserves special mention. The high-grade polyester oxford on the mattress is primarily laminated with TPU. The term TPU stands for thermoplastic polyurethane, and this is what makes the bed PVC and phthalate-free. They also help to minimize the relative stretch and ballooning levels of the mattress. The TPU is also known to be an extremely durable material. This goes a long way in making the mattress last for a rather long time. This is incidentally an extremely lightweight mattress given its strength and reliability. At under six pounds, this is almost half the weight of most air beds. It also comes with built-in handles for positioning the mattress properly. The manufacturers also provide an oversized storage bag for easy packing of this mattress. Customer service not very prompt or responsive and there was a lot of scope for improvement in this case. The Coleman Queen undeniably takes campsite luxury to a completely new level. 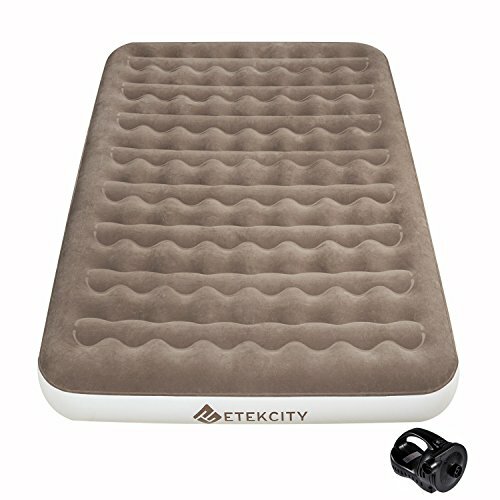 That is one of the most important reasons why this is one of the top contenders for the best air mattress for camping. 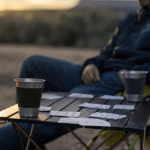 It is not just about a great mattress or a superlative sleeping experience; it is about offering something unique to the users and creating that stunning or surprise quotient in terms of their expectation at a camping trip. The Coleman Queen comes equipped with a cot along with the portable queen air mattress. 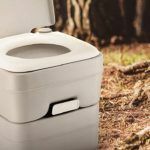 Whether you are traveling with family or friends, this can be a great feature and helps your guests be comfortable even on a camping trip. The specially formatted ComfortStrong coil construction offers both support and comfort to the user. It lets them relax better and rest in a meaningful manner. The steel cot that comes along with the queen sized mattress measures 600 pounds. The size of this cot is also quite adequate. It can easily accommodate anyone as tall as 6 feet 2 inches in height. Needless to mention, the elevated design of the airbed and the cot are extremely useful for guests and campers alike. It makes the whole experience lot safer too. This mattress also involves a 4D battery-operated pump, both indoor and outdoor sleeping provision and a versatile design. The steel frame is extremely durable and the cot can support as much as 600 lbs. There are also side tables and cup holders attached to this table. The airtight system guarantees no leak technology that enhances both the durability and performance of the mattress in a striking manner. This mattress also comes with a 1-year limited warranty period. The off the ground, elevated feeling is very relaxing for many users who have chosen to buy this mattress. Though sturdy, this bed is extremely noisy, and that can easily inconvenience a lot of people. Uncomfortable sleeping surface as the cot is not able to lock in a specific place. 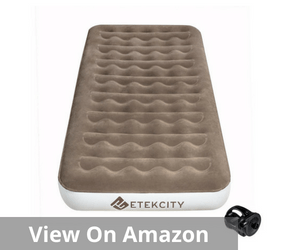 The Etekcity Camping mattress is a comfortable, portable, multi-purpose air mattress that can be used indoors and outdoors. 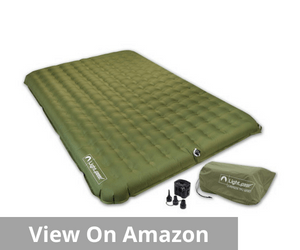 As a result, it easily features in the list of the best air mattress for camping. The mattress is made of a nontoxic material and comes equipped with a comfortable flocking top for better grip and more reliable performance. This is what makes the mattress a lot more effective too. The upgraded extra 0.35mm thickness adds to the comfort of the mattress. This is that unique feature which makes it extremely relaxing and provides home-like comfort. This is also one of those mattresses that is rather simple and easy to set up. The portable rechargeable electric pump facilitates easy deflation and inflation of the mattress. You can choose to charge this pump at home before your trip begins or you can even use your car charger at times of emergency. Storage and portability of this mattress are also relatively simple. When not in use, you can easily fold it away and relax. This is also one of those mattresses that come with a no leaking guarantee. The upgraded seam and superior welding man crafts make this mattress airtight. It also offers the possibility to adjust the firmness as per customer need. Inconsistencies were noticed after a few months of buying the mattress. The internal structure of the mattress seems to be crumbling after a few months of use. 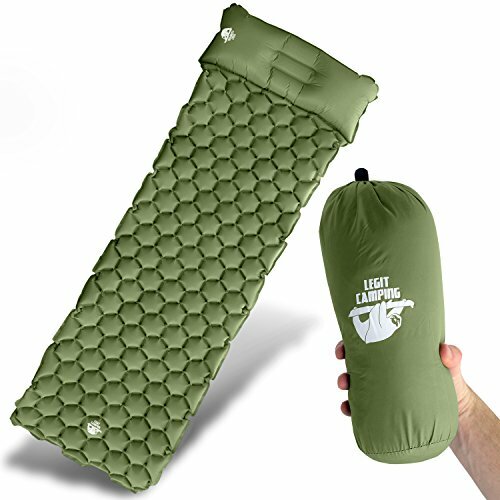 Another comfortable mattress that easily makes it to the list of the best air mattress for camping is the Legit Camping Sleeping Pad. This one also comes with an inflatable pillow and we do not blame you if this is your most favorite way of sleeping outdoors at the moment. This mattress is made of nylon and TRP. This significantly cuts down harmful PVC fumes and also makes it a very durable sleeping option when you are outdoors. Inflating and deflating this air mattress is rather simple. The air support cells are the most striking element of this mattress. They offer additional support and ensure that you are comfortable while sleeping. It literally gives you a feeling like you are floating on air. 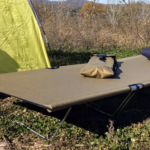 Whether you are camping on rocks, plain ground or a rugged terrain, this mattress will never let you feel the difference. 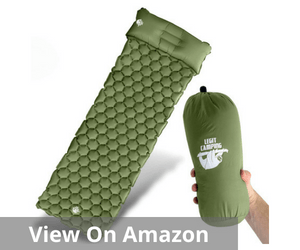 It promises a comfortable sleep outside wherever you choose to plonk the mattress during your camping trip. 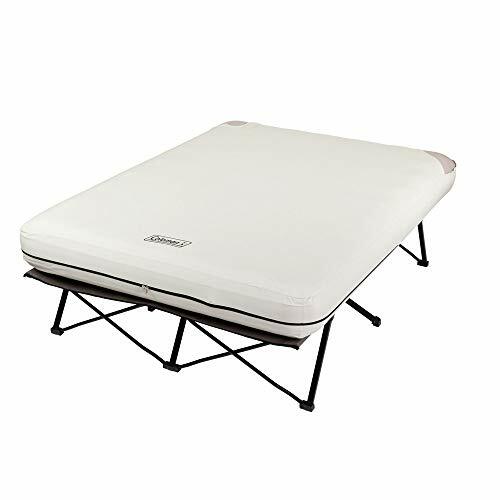 It is also an extremely lightweight mattress that adds to your convenience and comfort on a camping trip. However, most reviews indicate that it is not as comfortable as the company claims it to be. 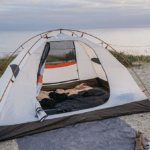 The relative weight and portability are undeniably the most important factors to consider when you are buying the best air mattress for camping. But that is not all. There are several other factors that you have to pay attention to ensure you have a comfortable and a hygienic sleep in a camp. The material that the mattress is made of and the cost factor matters. After all, you will never go and buy something that exceeds your budget too much. There are many types of material options when you are selecting the best air mattress for camping. Some are heavy, some are comfortable, some are easy to inflate and the like. But your most important criterion should be the scope of toxic emission. It is always preferable to go for non-PVC, non-toxic air mattresses made of environmentally friendly material. If nothing, they should not be responsible for any type of harmful emission. They should not be harming your health in any meaningful way. Neither should they harm the environment. Nothing that you are carrying to your campsite should be heavy. Not only does it become cumbersome, but also tiring in case your campsite is too far away from the parking. So always look for options that are lightweight and easily fordable. That will ensure that you can optimize the comfort during your trip without compromising on the weight factor. Remember the more weight you carry, the more you have to only haul up to the camp. It is always better to opt for a compact and lightweight variant that guarantees maximum comfort for the users. Air mattresses are available in a large range of options across the board. From queen sized options to single bed mattresses, you can get them in a large number of sizes. While you are making a choice, be practical. Think about the measurement of your tent and what size fits in best there. Based on that, you must choose the size of the mattress. 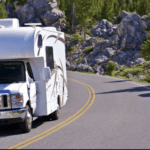 After all, you are not going to spend your entire life on it, so it is best to choose something that can fit into your car easily and also adheres to the measurement of your camp. Above all is the budget. 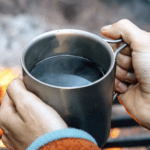 Camping is an expensive hobby, and I am sure you have allocated a definite amount of money. Make sure you don’t overshoot that. For this reason, you have to make budgetary allocation for every item and gear that you have to invest in. It is most advisable to invest in a mattress that fits your budget and also has the requisite number of features that you want. 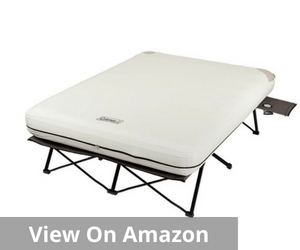 Any piece that can match these two factors will give you the best option for an air mattress for camping. 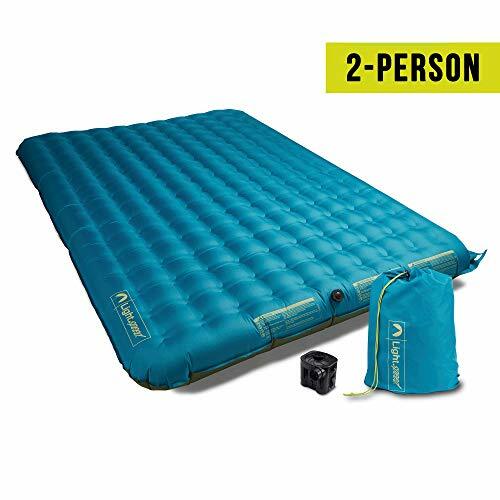 Therefore, it goes without saying that the best air mattress for camping has to be decidedly one that is a perfect balance of features and cost. You don’t have to unnecessarily stretch yourself too much, neither is it necessary to compromise too much in the name of fitting into a budget. The core idea is to go for a value buy that offers the maximum advantage and also makes your camp stay enjoyable. The need for an ergonomically crafted mattress is imperative. That alone will ensure that you have a proper sleep at night. 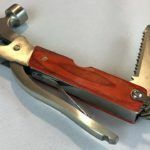 In many ways, this can ensure that you have as much fun during the day while you are camping.